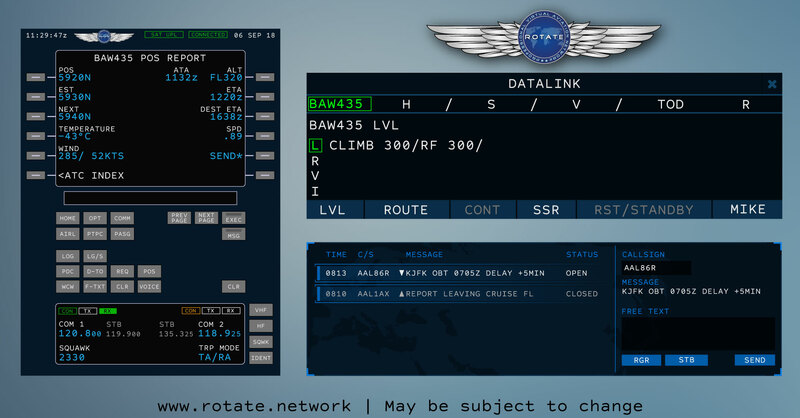 Since its first release in the late 90s, CPDLC (Controller – Pilot Data Link Communication) has changed the way we communicate in aviation. It has seen a steady rise in popularity and is now a widely accepted, standardised tool in the aviation industry. CPDLC has even found its way into the virtual aviation scene through plugins. However, the current integration in virtual aviation networks can be more of a hassle than a benefit. We are going to change this! Rotate Network will implement CPDLC network-wide. That means everyone using Rotate will have access. Pilots, air traffic controllers, and even airlines will be able to use it. © 2017-2019 Toolkit Systems UG (haftungsbeschränkt). All rights reserved.